In a museum in the small town of Bayeux in Normandy, specially devised to hold this single object, is a strip of linen nearly one thousand years old. It is 230 feet long and about 20 inches high. On it, embroidered in brightly colored wool, are figures of men, animals, buildings, and ships. In a series of vivid scenes, with a running explanatory text in Latin, it relates the invasion of England by William of Normandy and his victory at the Battle of Hastings in 1066. Nothing remotely like the Bayeux Tapestry exists anywhere in the world, yet comparatively few people have been to Bayeux to see it and appreciate how totally absorbing it is. This book, first published in 1985, reproduces the Tapestry in full color and makes it accessible as never before. 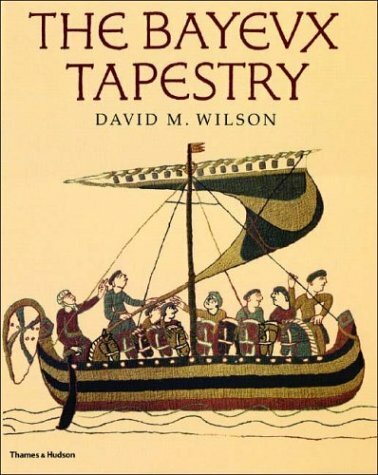 The story told in the Tapestry has all the ingredients of an epic poem, and a cast of characters that includes King Edward the Confessor; his liegeman, Duke Harold; and William, Duke of Normandy. When Edward dies, Harold succeeds him as king. William, who has a better dynastic claim, invades England, and at the Battle of Hastings Harold is defeated and killed. Here the Tapestry breaks off, but it probably originally concluded with William's coronation--the beginning of a sequence of monarchs that has continued virtually unbroken until today, and of the English nation as we know it. The Tapestry is reproduced in full color over 146 pages, with captions on a fold-out page for easy reference. A second reproduction of the Tapestry in black and white has a detailed accompanying commentary. Sir David Wilson, former Director of the British Museum, provides an up-to-date summary of the historical evidence, explaining each episode and coveringrelated topics such as the costumes, armor, ships, buildings, and customs. One of the primary sources for the history of the period, the Tapestry is a social document of incalculable value. It is the sole survivor of an art form that may once have been widespread, the wall-hanging commemorating the deeds of a great man. Used Like New (1 available) HPB INC.